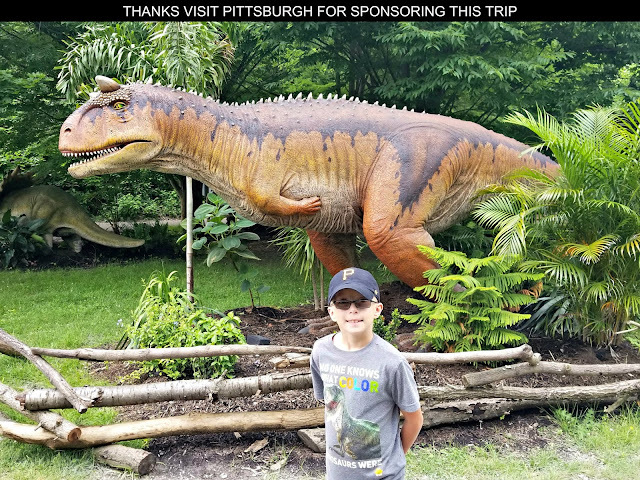 When you enter a town known as a vacation destination it can be easy to bust your family's budget on meals with hyped up prices from restaurants looking to cash in on visiting tourists. If you want to enjoy dining out while on vacation but also need to be a budget conscious traveler consider skipping the touristy spots and find out the establishments the locals frequent. These diners, restaurants, and taverns will often provide you a taste of what makes the community appealing to the people who live there and a menu that's priced more down to earth to be affordable to the locals who make an average living servicing all the tourists who are in town. Plus often times you may just find something delicious and unique to eat or drink as these establishments provide something produced locally or that caters to local tastes. So where do you find out where the locals hang out? Well you don't want to find out through the visitor magazines and pamphlets that promote a town because those tend to be all sponsored editorials and ads where you'll most likely find some of that advertising expense added into the cost of your dinner tab. Also beware that often times hotels and resorts get commissions or have referral deals with local establishments looking to cash in on visiting tourists. One way I often get tips on the best places to eat while on vacation is by picking up some postcards and taking them to the local post office to mail to friends and family. Instead of just throwing the post cards in a mail box or slot though, I go up to the counter to buy some stamps and strike up a conversation with the person working the counter about interesting things to do and best places to eat at while in town. I always get great suggestions that help filter out which places are truly worth while to visit and which ones are primarily tourist traps. Another good spot to get some honest advice of what the locals think about area restaurants is to swing by a grocery store to pick up some snacks. While you are doing your shopping ask some of the staff where they frequent and which restaurants they'd recommend to their friends and family. Speaking of friends and family, post online through social media that you are thinking of visiting a particular place and ask if anyone has been there or knows people there that could give you some recommendations. Then Yelp their suggestions. Just don't post when you are actually going because you don't want to worry about who knows who seeing that information and returning home to find your house cleared out by some robbers who knew you were out of town. With its housemade white fish dip for an appetizer and bison sloppy joes for a lunch or dinner this restaurant has a unique menu that for being part of a brewery is very family friendly. 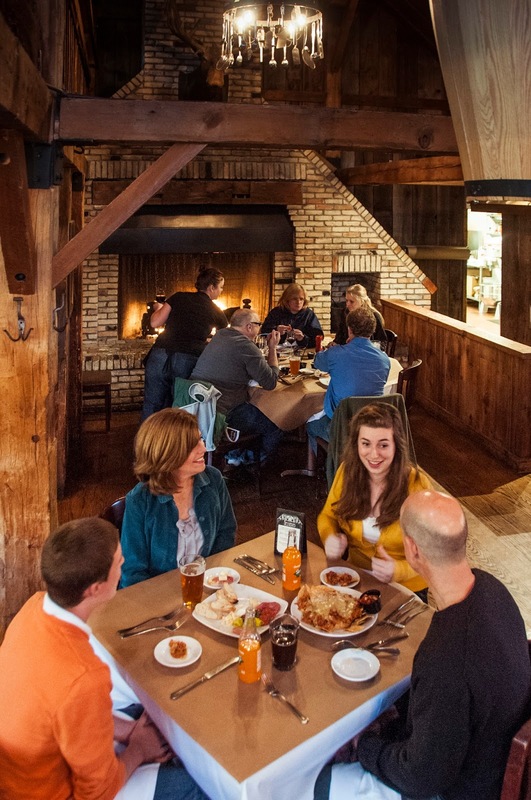 The barn like decor of the building gives visitors a Sleepy Hollow vibe as they enjoy their meals. 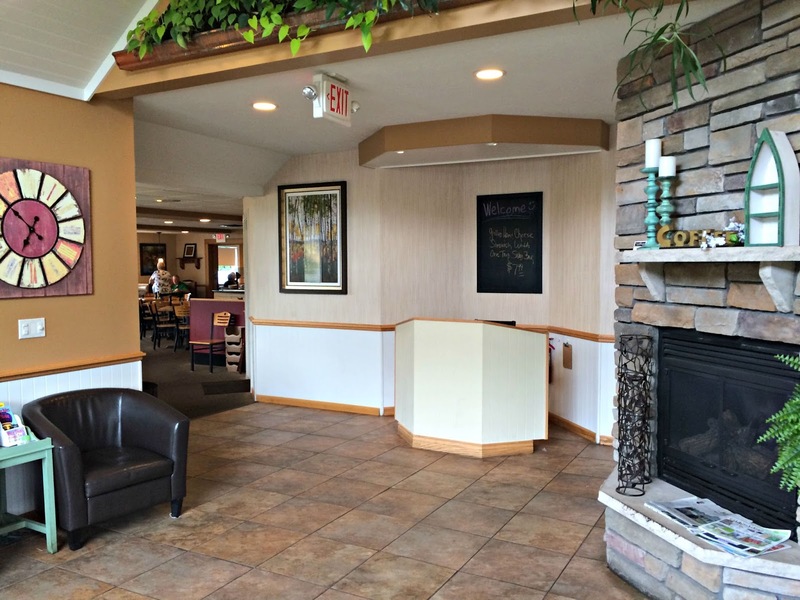 The atmosphere and food make this a delightful spot to enjoy a memorable meal. The restaurant is tied to a brewery which provides some great beer selections to enjoy during a meal but I'd suggest giving their hard cider a taste which is brewed from apples harvested from an on-site orchard. I'd also note that during our visit we had exceptional service and they even went out of their way to make something special for my picky eater son when he didn't particularly care for anything on the menu. The Jolly Pumpkin is a bit out of the way from many of the normal tourist spots as it located mid-way up Old Mission Peninsula in a rural spot that is somewhat of a haul to get to from where most of the downtown and beach activities are at. 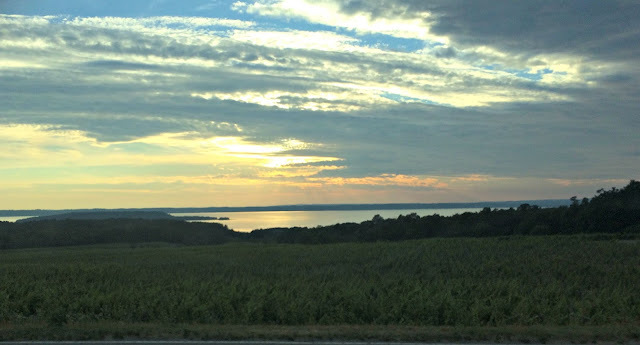 It is a scenic drive to The Jolly Pumpkin with some great views of Grand Traverse Bay and a nice way to unwind while you are on a vacation getaway by taking the drive over there. 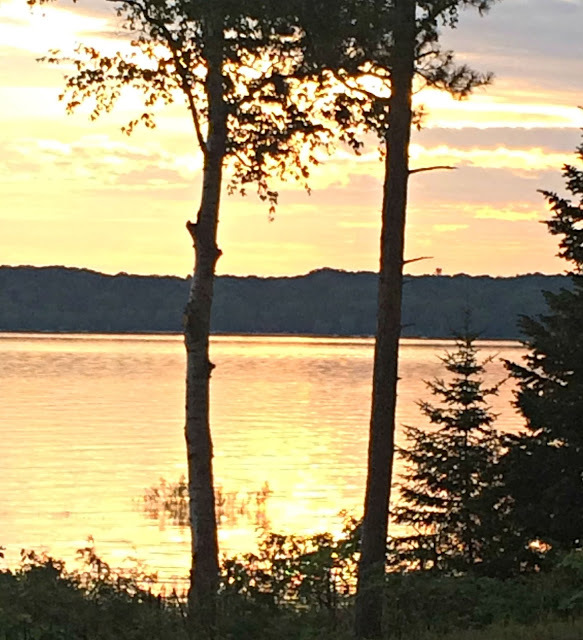 The quickest route is to take M-37 straight there from downtown Traverse City but I'd highly recommend meandering along Peninsula Drive enjoying the wonderful scenery along this path instead. 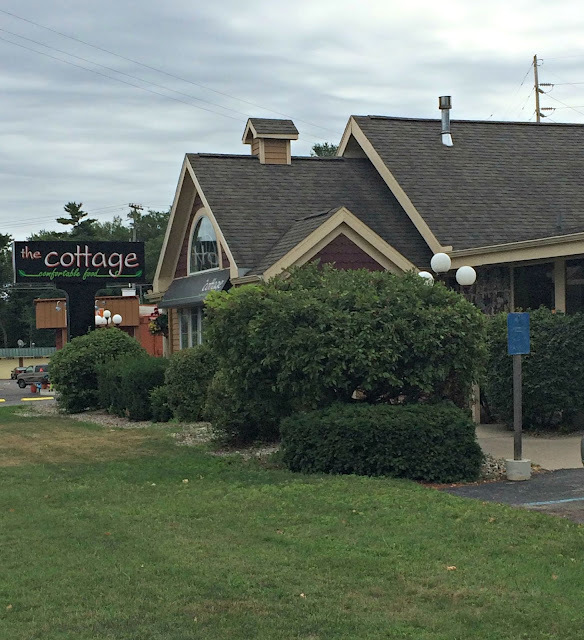 This casual and comfortable diner is located along M-31 just west of the Traverse City State Park. The Cottage's specialty is All You Can Eat Freshwater Perch which it has been serving for more than 20 years. 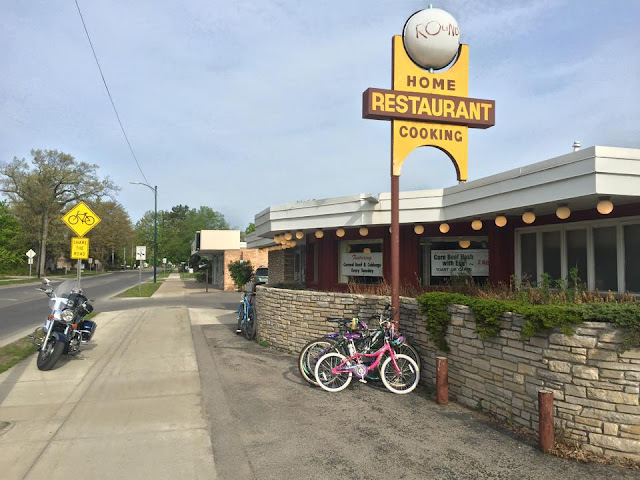 It caught our attention because it seemed to be the place a lot of seniors were going to eat which normally means good food at affordable prices. We weren't disappointed! 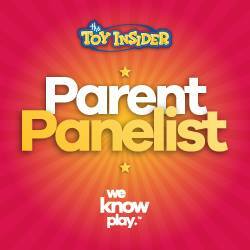 They have great deals when it comes to Kids Meals which range in price from $3 to $5 dollars. My kids received generous portions and really devoured their meals which they only do when what they are eating is really good. So this was a really great deal when it comes to families with kids looking to eat out. It just wasn't the kids who enjoyed their meals though. I ordered the meatloaf which The Cottage brags is based on a family recipe. It was loaded with mashed potatoes, gravy and fried onions and I literally was licking my plate off as I finished off my meal it was that good. Located on Front Street in the heart of Traverse City this wonderful pizzeria creates pizza pies from its own housemade dough and locally supplied ingredients that is a perfect meal for a hungry family on vacation. They still hand-toss the pizzas as they get the dough ready for the oven and each one is handcrafted with sauce and toppings. No pulling a ready made pizza out of the freezer and throwing it in the oven here. 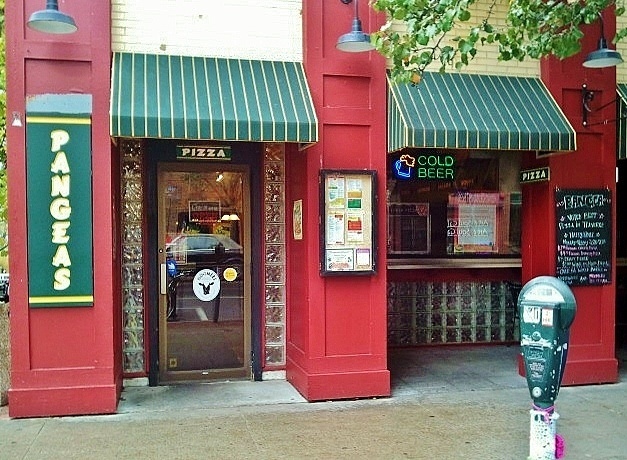 The restaurant has a great downtown vibe to it and is a fun place to hang out while enjoying a meal. It does have limited seating though and is a popular place that tends to have a line and crowd to get in. If you don't feel like eating at Pangea's they offer carry out so you can order ahead and just pick it up to eat at the beach or the place you are staying. We enjoyed the pizza so much that we went back the day our family was leaving town to bring one back with us to eat when we got home as a final reminder of our great Up North trip to Traverse City, Michigan. Built in 1882 by a Bohemian wheelwright named Vencil Sleder this is the oldest continually operated restaurant in the state of Michigan. 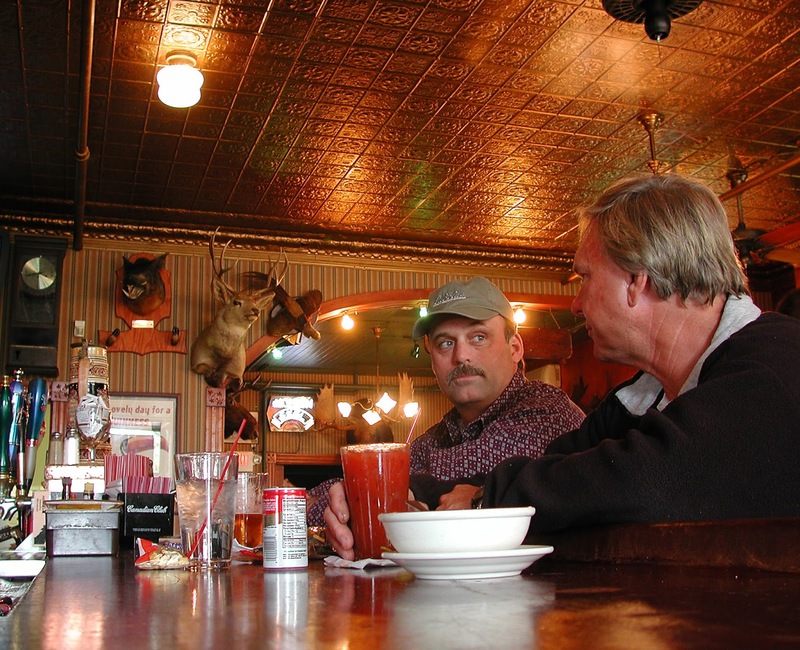 Among the hunting trophies and stuffed animals that decorate the place is a moose named Randolph and it is a local tradition to KISS THE MOOSE FOR LUCK. 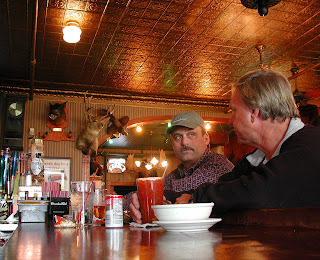 With a tin ceiling, hardwood floors and more than a century old mahogany bar this place seems like it will really take you back in time to the lumberjack days gone by of the region during a visit. In fact the tavern is located in a neighborhood called Slabtown which is an old working class district of the city where the houses were built with slabs of scrap wood salvaged from the local sawmills. This tavern the locals call Lil Bo's started off as a hot dog stand that was the cover for a secret speakeasy during Prohibition. The second oldest tavern in Traverse City after Sleder's it was named in honor of the Bohemian community that settled in this part of the state. The place is know for its great "sammiches" , olive burgers, eggplant, gnocchi and lasagna plus some Bohemian recipe house specials. Is a breakfast joint that locals praise for its homemade hash. Hash, hash, hash when someone speaks about Round's that is about all that comes out of their smiling mouths. If you enjoy a good breakfast it appears that Round's is the place to go and is a popular hang out spot of the local residents. My insider's tip is to order the Red Velvet Hash Omelet but I've head lots of good things about almost everything else on the menu too especially from the helpful lady I spoke to at the post office. Only downside is that it appears to be a small space and not always easy to get a seat. 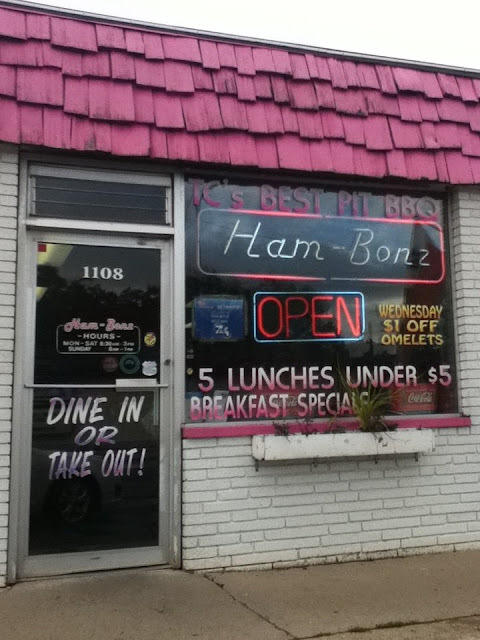 Talk about a tiny, quaint place to eat, Ham-Bonz serves up smoked ham, turkey, beef and pulled pork for enormous omelets and sandwiches cooked up from a backyard pit grill. I've been told this is the closest thing to pure Southern BBQ you'll find outside of the Mississippi Delta. 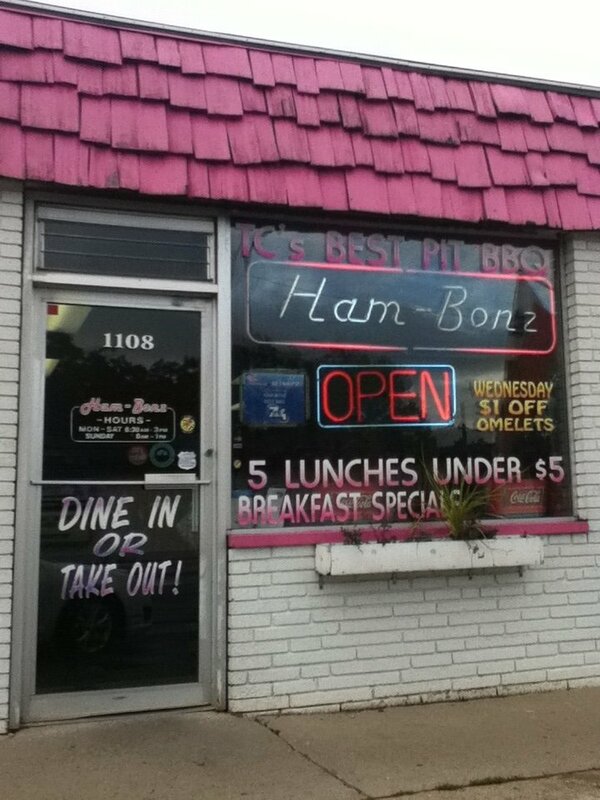 My wife and I love pulled pork so we absolutely have to get around to checking this place out. I think I read this post last week, actually, but forgot to comment. Interesting that restaurants who advertise may add those costs into the meal prices - I never thought about that. And I agree, on vacation it's always great to eat at local/"townie" places. I love eating out where the locals eat. When we first moved to Hawaii we were in a hotel for almost 2 full weeks and always asked the 2nd shift clerk for the best places to eat, non tourist places. We found that although the tourist places had decent food, they were overly expensive and we could get a lot more for our money at the local places. Great idea, and great a tip while traveling. We tend to spend way too much of our budget on eating out. I agree I like to visit the small local restaurants rather than the chain restaurants. Their prices and food tend to be better. I like to ask the locals their favorite places. Thanks for the tips.